Humla district, one of Nepal’s highest and most inaccessible district, is located in the far northwest of Nepal and has a population of around 45,000 living in scattered enclaves in the lower valleys of the Himalayas, between 1500-7300m altitude. Simikot, the district headquarters (indicated with the yellow dot in the map below), has a dirt airstrip that lands only a few flights per week in good weather. The closest road-head in Nepal to Humla is nine days walk to the south; and from Tibet six days walk away to the northeast. These isolated mountain communities rely on subsistence farming and minimal trade with Tibet and India. Here, isolation and poverty in a harsh mountainous land deprive people of all but the basics of life. 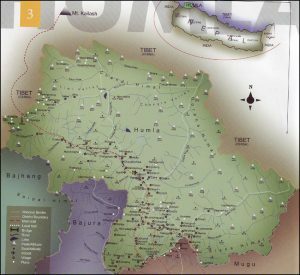 Its population of Tibetan speaking Buddhists and Nepali speaking Hindus lives on forested alpine slopes or villages overlooking steeply terraced strips of cultivated land. Existence is day to day survival. Agriculture is the main activity and source of income, even though just 2% of the land can be used for cultivation, due to the harsh terrain. Much of the district is high Himalaya; the main passes can be closed for up to four months of the year by winter snows. Flash flooding is a danger in the spring and monsoons bring weeks of rain through the summer. Humla is an area of incredible beauty. Its sheer remoteness and inaccessibility have inspired legends. It is believed by some to be the home of the mythical Shangri-La But that same remoteness and inaccessibility means that very few government services reach this far. A chronic lack of education and healthcare, coupled with a recent history of political conflict, has left many of the people in Humla in the dark ages – illiterate, malnourished with a life expectancy twenty years less than our own. In some areas as many as 1 in 3 children will not survive until their fifth birthday. It is recognised as an area of extreme poverty, the UN ranks it one of the poorest in the world, equalled only by certain pockets of sub-Saharan Africa. Deliveries performed by trained health workers: 44%. In Simikot the Nepal Trust has its local field office. Here all project related field activities are coordinated and implemented.